Heat olive oil in a pan, add onion and fry well. Now add carrot and garlic and saute for 5 minutes. Add coriander powder,Pepper powder and salt. Cook for about 3 minutes and add vegetable stock. Bring to boil and simmer for about 20 minutes. Add fresh coriander leaves and let it cool. Blend it well and add lemon juice and required seasoning. Now, Carrot and Coriander Soup is ready to serve. 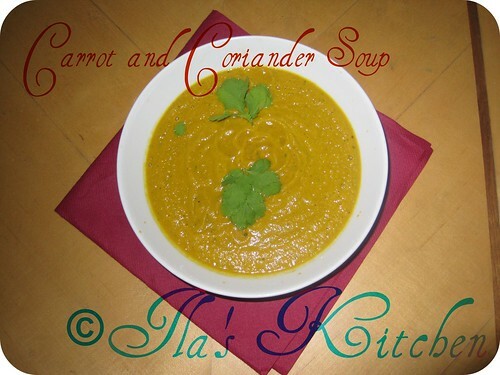 This healthy Carrot and Coriander Soup can be served for evening snacks and for dinner. It's yummy and healthy! Souperb! looks comforting and creamy too..
perfectly made soup creamy n yummm..
Soup looks super comforting and creamy..delicious..
A classic soup and yours looks so creamy. Very healthy soup and looks so nice. It looks so creamy. 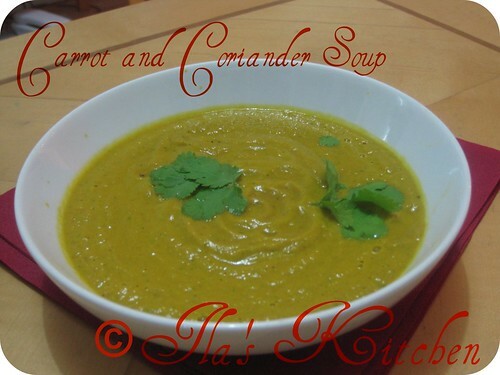 Love this version of adding cilantro to carrot soup.